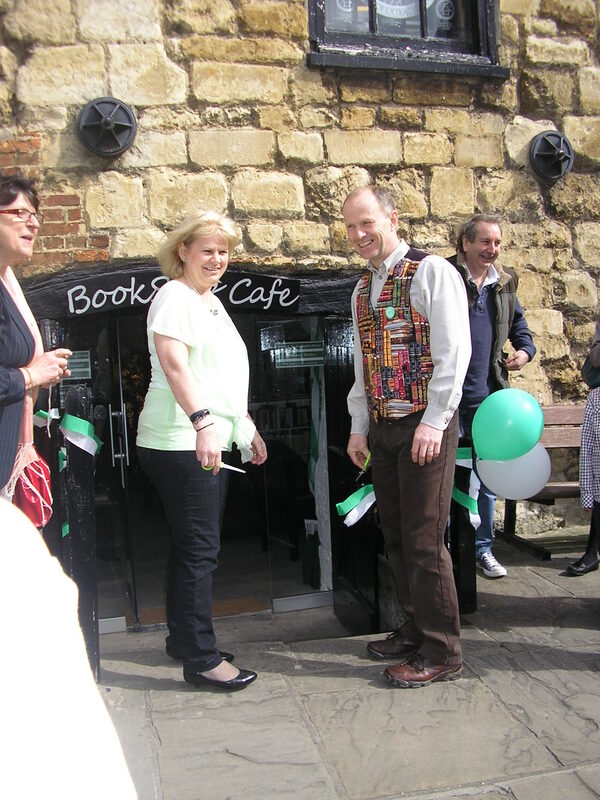 This past Saturday, 4th May 2013, they opened the BookStop Cafe Lincoln. The idea is brilliant: a book shop that supports independent and local authors where you can sit and drink a fabulous cup of coffee and have some cake. Or, to stand the idea on its head: a coffee shop where you can sit leisurely and drink a fabulous cup of coffee… whilst also perusing, and purchasing if you so wish, some of today’s best fiction as brought to you by the local and independent authors that Joff stocks. AWESOME! It was my great pleasure to be present for the Grand Opening and here are some photos for you to share in the excitement. Cut, cut, cut that ribbon, Joff and Becky! Done! 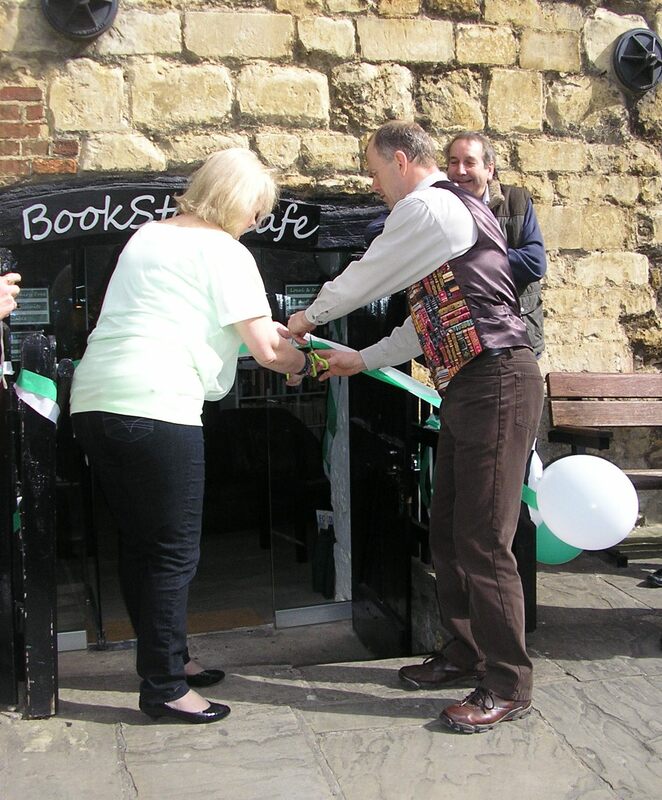 The BookStop Cafe is open. And the sun’s come out and the bells are ringing. Amazing! 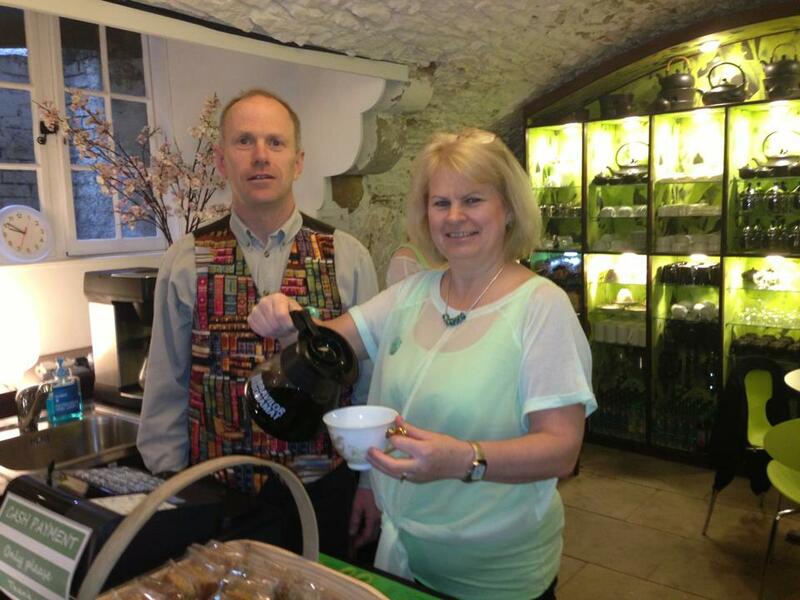 Proud coffee shop owner Joff and local author~Me! TWO proud owners ~ Joff and Becky. Photo courtesy of Lizzie Lamb, with thanks. Cakes. Did I mention you can get fabulous cake here? Photo courtesy of Lizzie Lamb, with thanks. Woohoo! I am ON THE SHELF! 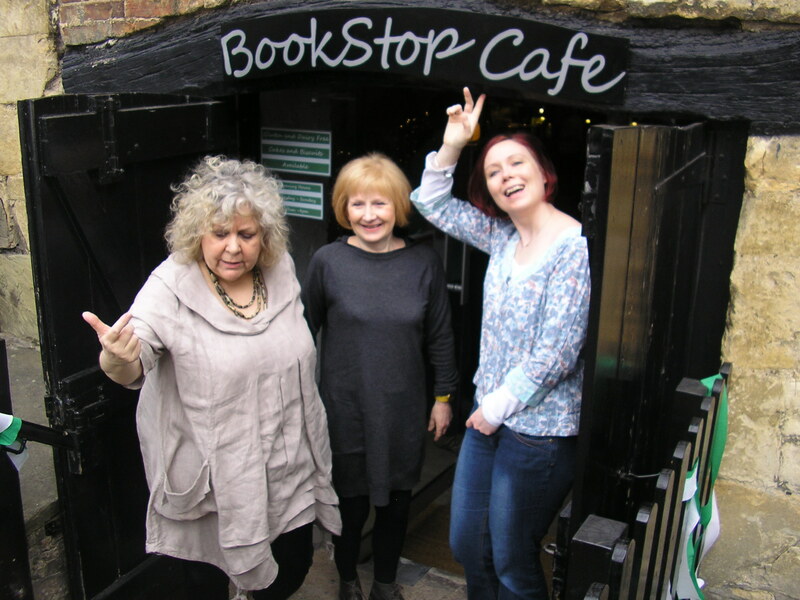 Happy BookStop Cafe customers! 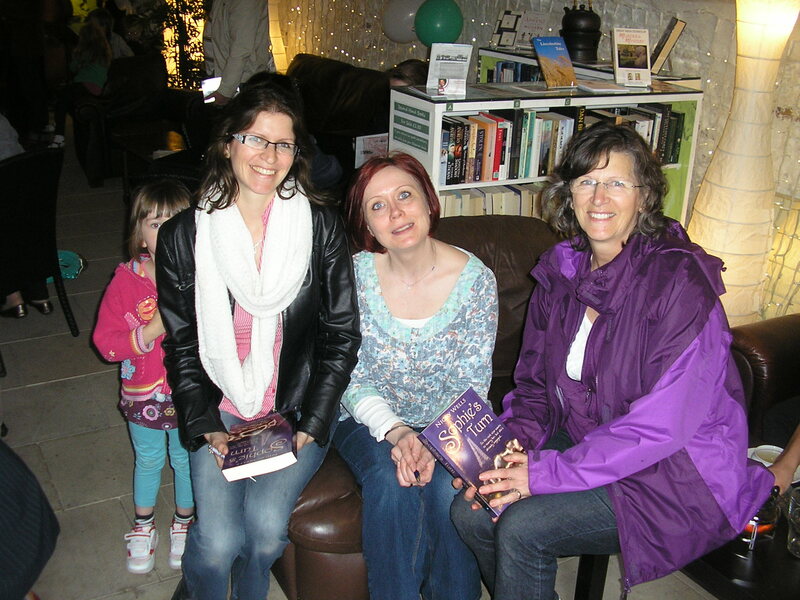 They had cake, they found a book, they got it signed… Everybody’s smiling. What a result! Huge congratulations again to Joff and Becky and wishing you every success. Rock on! Or, if you can’t get there, find it on TWITTER. Or visit Joff’s WEBSITE. 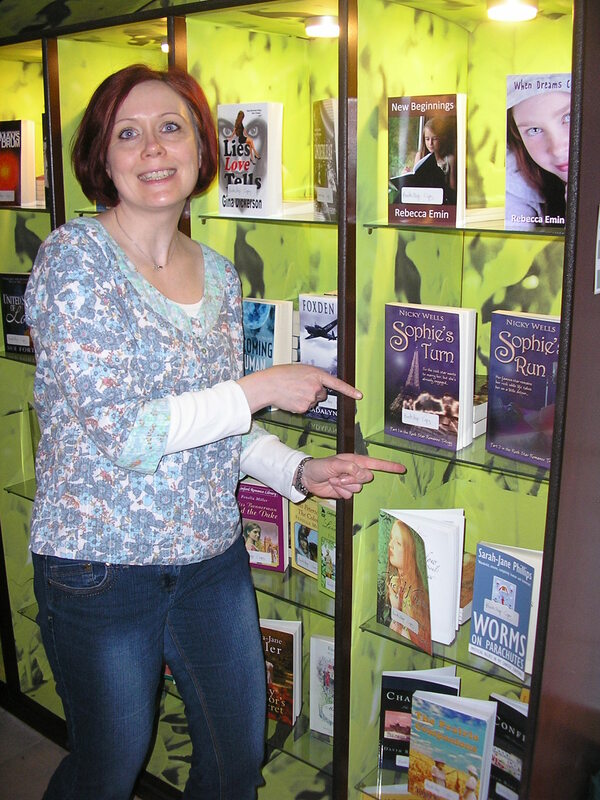 This entry was posted in Miscellaneous and tagged Authors, Bookshop, BookStop Cafe Lincoln, Joff Gainey, Lincoln, Sophie's Run, Sophie's Turn. Bookmark the permalink. This looks such a cool place, I am definitely going the next time I’m Lincoln way! Nicky, this looks like everyone’s ‘dream’ bookstore! Best of luck to the owners! Brilliant photos, great post, Nicky! Thank you very much to Nicky for this lovely Blog and for never ending encouragement. Oh wow that’s so exciting!! Congrats Becky and Joff! And what’s even more exciting is when I finally sell up here in Portugal… Lincoln isn’t that far away from where I’ll be living!! I love that place! The low vaulted ceilings add to the atmosphere. Now, I have to ask, in one of the photos (I think from your gallery) on Facebook, is that The Crooked House in the foreground next to the the building the bookstore is in? Back in 2005, hubby and I stopped over in Lincoln and wandered around by the castle and the cathedral, down Steep Hill and around the shopping are before coming back up and walking by The Crooked House. Best of luck to Joff and Lindsey and I’ll definitely be dropping in the next time I get to Lincoln. Wish I lived there so I could go for cake and coffee and browse the great books I see on display – such as Sophie’s Turn. 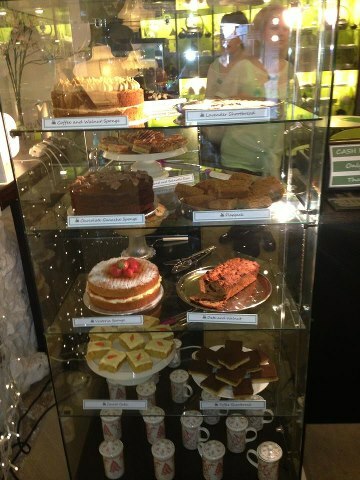 Those cakes look wicked….. Good luck with it, looks brilliant. Fabulous Nicky. Every village, town, city should have one. A brilliant creation, even if it does look far too posh for me to ever step into! I live in Aby near Louth, so I’ll be in next time I’m in Lincoln! It *is* brilliant and you should definitely come and visit, you are most welcome, Ian. 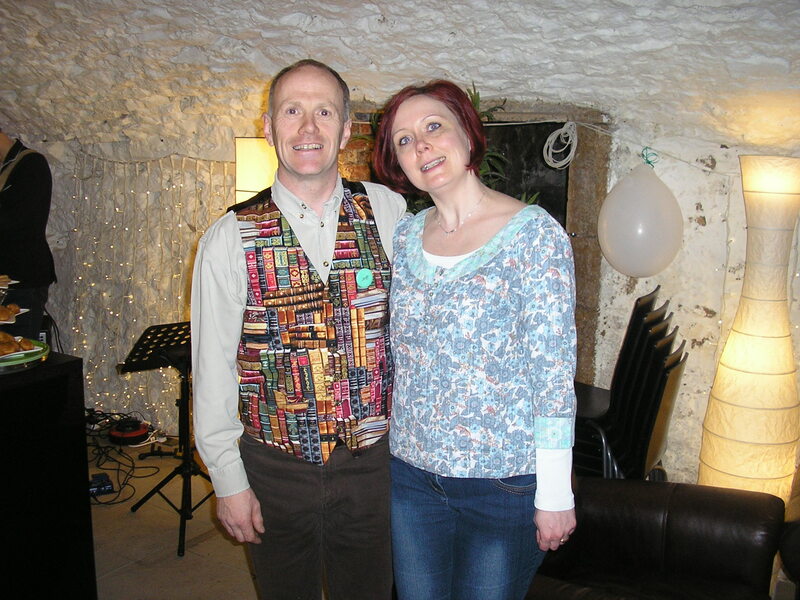 You don’t need to look posh and you definitely don’t need to wear a waistcoat like Joff ~ he likes to wear his book-adorned waistcoat for good luck, that’s all. 🙂 See you there sometime! Wish I lived nearby – looks divine! And those cakes… congrats to all involved and your books grace that cabinet perfectly Nicky!! Lizzie, thank you for your kind comments. It would be lovely to see all four of you. 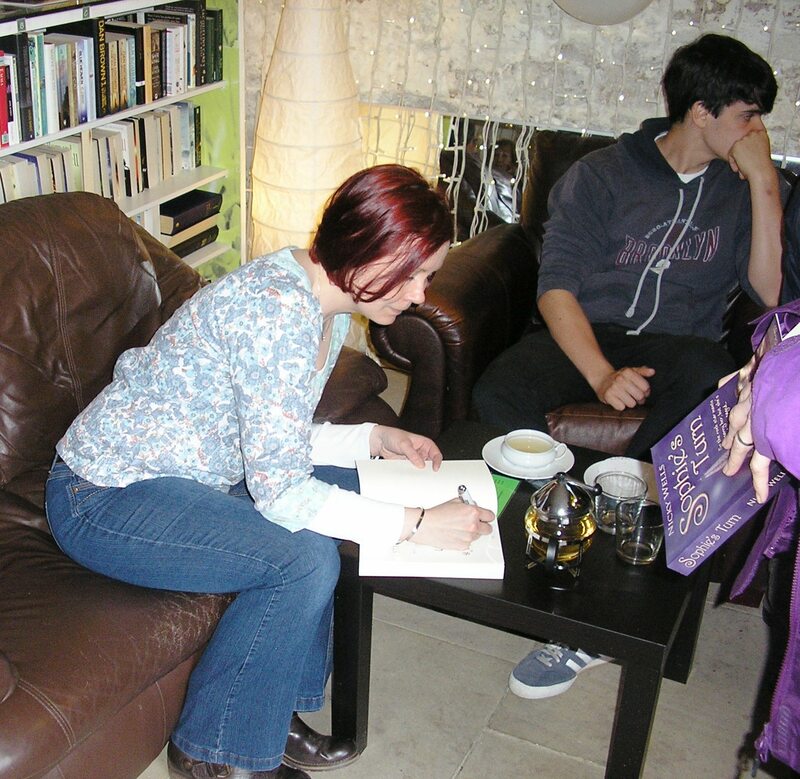 Perhaps a book signing event should be the order of the visit? I’m so glad the opening went so well! Thanks for the photos, Nicky, so those of us too far from Lincoln got to live the event vicariously! Best wishes to you, Joff, and to Becky, and wishing you both every success. You and me both! x Let’s do it together and then we’ll really rock this town!! !